At the ICAF (International Community Arts Festival – Rotterdam) of 2003 we – Pregones, Arena y Esteras, Tswepa and Sering – met for the first time and watched each others performances in full amazement. Driven by curiosity we looked each other up in between the many shows to talk about everyone’s local operations, to exchange texts and ideas, and mostly to figure out if it would be possible to collaborate. We were clearly attracted to one another. According to Arnaldo J. Lopez (Pregones) it was a combination of respect and intuition. Respect, because we all chose to work at social transformation through artistic creation. Intuition, because based on this first meeting, we could imagine perfectly how we could all be working together to create something new and exciting and good. After the festival, when we all returned to our home bases, a proposal for cooperation was drawn up, and a period of intensive mail traffic followed. To avoid endless travelling back and forth, and also to involve the participants of the different organizations, virtual cooperation appeared to be the solution. In 2005, ‘De 14-daagse van de Broederschap’ (‘The fortnight of the Fellowship’) was held at Sering (Antwerp). Arena y Esteras and Tswepa gave workshops to the actors and participants of Sering. Afterwards, the groups traveled to the ICAF together, where Pregones was also present. The core group was, after two years of e-mailing, complete again. From the moment festival organizers had knowledge of our plans, they offered us optimal possibilities for the core group to come together in their programs. As well as in Germany (the Cactus festival and the Madness and Art in Muenster), as in Slovakia (Arte & Therapy festival in Banska Bystrica) and in The Netherlands (ICAF in Rotterdam). We were supported where possible. These personal meetings were indispensable to get to know the daily realities of the partners and the living- and working conditions, and to build up trust. Soon it became clear that we needed to develop technical know-how applicable for virtual use on the different continents. In August of 2007 a media training was organized for this in Belgium. For ten days we were taught by Pascal Poissonnier on the topic of editing, blue key, the practice of the different systems and how to combine them with each other, etc. With this foundation we began working on three ‘pilot projects’ (Pépé’s Island, Brides and Dream Travelers – see “past”:/en/home/past.html). Here we applied different collaboration methods every time. As a reward for our hard work, World Carrousel was officially acknowledged by the Theatre Education and Training Committee of Unesco later that year! In May of 2009 we passed the experimental phase. The partners met again at Sering for a ten-day meeting, where we evaluated the pilot projects and where we finalized our methodology. A protocol of cooperation was drawn up and signed, and our first collective annual planning was designed. After these ten days we all felt: now there’s no way back! With private sponsoring, a virtual office was designed between June of 2010 and April 2011. The projects in the annual planning served as study cases to finalize and test the office. 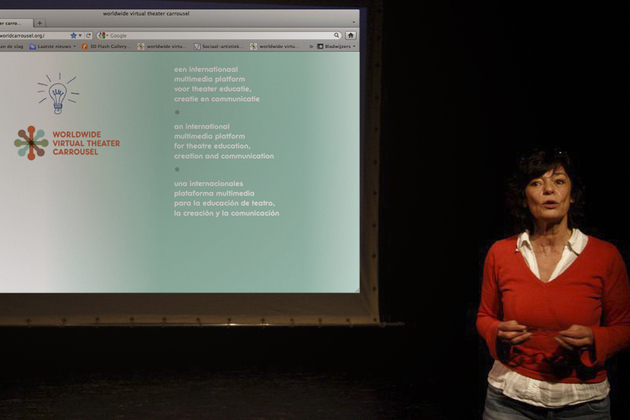 The virtual office was introduced at ICAF 2011, together with this website. In addition, World Carrousel was joined by a new partner: Debajehmujig from Wikmewikong, Canada. The office is our collective working environment. Here, we initiate projects with participation of our local communities, as well as our professional work. So our work is not finished. ”It’s a lifelong commitment!"